It's been such a long time again since my last post, but at last I have a finish I can blog about. 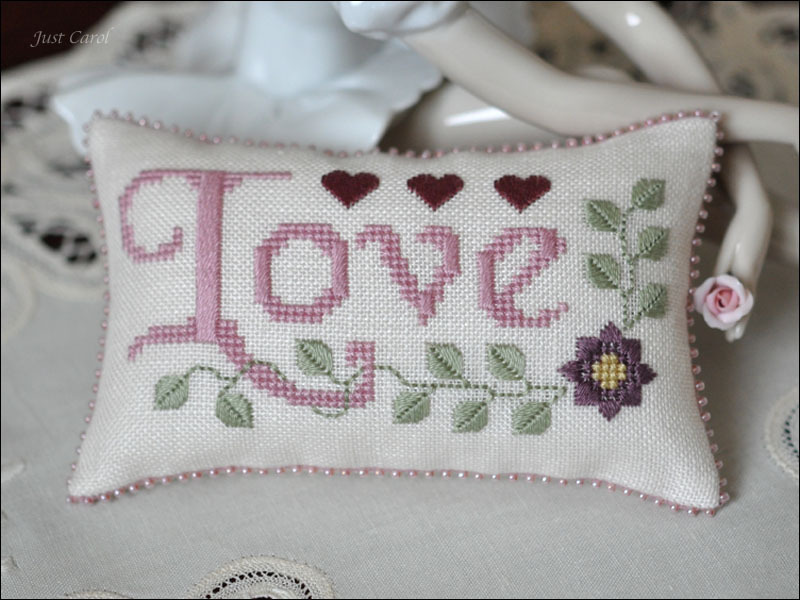 This was on my 'to do list' years ago, it's Love by Betsy Foster of Elizabeth's Designs, and can be found in the February 2001 issue of The Cross Stitcher. It was also once a complimentary design. I've used 32ct Country French Chantilly fabric and instead of the listed Kreinik Silk Mori and Silk Serica I chose similar shades of DMC. It's just a little pillow finish - I love little pillows - with a beaded edge and with mine and Colin's initials on the back. I've also recently finished The Bookshelf by Little House Needleworks but I can't show you that one just yet because the battery ran out on my camera before I had chance to take any photos. I hope to be back blogging a little more regular, although saying that Colin is due back home from work next Friday, after being away for 7 weeks - Woo Hoo! He's only going to be home for a few weeks though, so I expect my next post won't be until he's off back to work again!